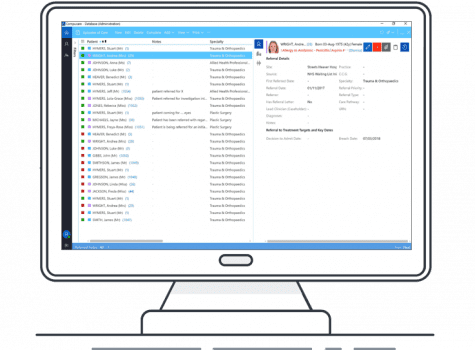 Manage referrals and activities for multiple departments, improving communication across departments and care teams. Enforcing full referral to treatment (RTT) management, Clinical Manager warns which patients are close to, or at risk of, breaching waiting time targets. The Care Episode Manager screen allows clinicians to view multiple RTT clocks, edit details, generate letters, and record notes. Streamlined waiting list management allows clinicians to prioritise patients awaiting appointments and book an appointment directly from the waiting list. User-defined test templates allow clinicians to record test results and monitor a patient’s progress. Create complex calculations, defining normal and abnormal ranges and define warnings which appear when certain values are entered. Carry out detailed multi-disciplinary assessments and capture a variety of information including problem history, standard observations, clinical investigations and tests. Access to a comprehensive collection of reports including waiting list management, first contact, end outcomes, waiting period analysis and referral status. All correspondence, including documents from external sources, can be stored as part of the patient record and information regarding a patient’s care and future requirements, can be produced for their GP or another third party. Letters and forms can be pre-populated with key patient data, personalised with your company logo and then printed or sent electronically – increasing accuracy and saving time.